The Email Air Handling Water Mist Eliminator effectively removes water or oil mist, fog and droplets from new or recirculated airflow. 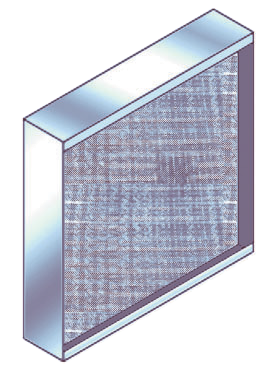 Designed for use in applications requiring air to be free of condensation, such as electrical equipment areas and transmitter stations. Can also be used in conjunction with steam or mist type humidifiers, or in HVAC systems with air or chilled water coils. The Email Air Handling Water Mist Eliminator effectively removes water or oil mist, fog and droplets from new or recirculated airflow. Designed for use in applications requiring air to be free of condensation, such as electrical equipment areas and transmitter stations. The 2 inch deep media pack consists of multiple alternate layers of crimped and flat woven screen. It is encased in a rigid, 4 inch deep enclosing frame, designed to prevent any air by-pass. An all stainless-steel construction ensures that the Water Mist Eliminator is fully protected against corrosion.. The Email Air Handling Water Mist Eliminator must be installed vertically to ensure peak operational efficiency. A ‘TOP’ label is included on the unit for proper orientation when installing. As water is channelled through the bottom of the unit, mounting hardware needs to be designed accordingly with adequate drainage.